Rivers on Yandex Map Editor are composite linear items that are not drawn on the map, but rather compiled from sections of riverbed (each of which is drawn individually and assigned separate attributes). For more information, see section 3.10.2. Rules for adding attributes to hydrographic items. Rivers are created as individual items when you fill in the Part of attribute panel for the riverbed section (for more information, see section 3.10.2.2.1). 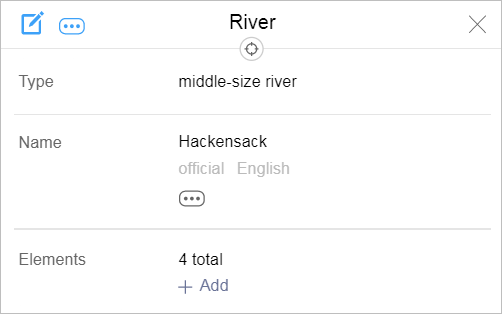 After you create the river, its name will appear as a link in the attribute panel for that section of riverbed. Use the panel to add attributes to the river. Techniques for adding attributes to rivers are similar to the techniques for adding attributes to all items on YME. Major river — a river that is at least 1,000 km long and is known throughout the world. Large river — a river between 400-500 km in length that is well-known. Middle-size river — a river that is at least 20 km in length, but not longer than 400-500 km. This category also includes named streams and channels regardless of their length. Small river — unnamed rivers, named rivers less than 20 km long, and un-named streams. Intermittent river — all rivers that are drying up, regardless of their length. Channel — named channels (other than those that are labeled as major or large rivers as exceptions to the rule). Drainage channel — irrigation and drainage channels. When selecting a river type, you must preserve how the river system is connected: each class of river should connect to rivers of higher types to form a united (connected) system within the boundaries of that river basin. When selecting a river type, you must preserve the hierarchy the river system. For example, a given river can not be tributary to a lower type of river. For example, a large river can not be a tributary to a small- or medium-sized river. Therefore, a river that relates to a lower type than its tributary based on its physical characteristics will be assigned the same type as the tributary. Rivers that connect channels should have a type no lower than “Middle-size river”. 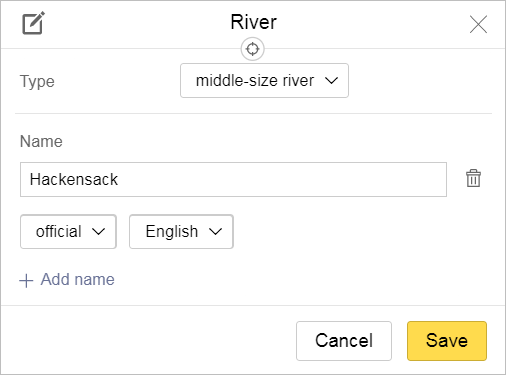 If the river is not on the map yet, you must fill in this field manually: enter a name for the new river and it will be created. The techniques for entering river names are similar to the techniques for entering names for all items on YME. When you duplicate a riverbed or channel using a polygon, assign Reservoir attributes to that item. Don't name these polygonal items: the Name field should be left blank (see point 3.10.2.1.3. Duplicate a riverbed or canal with a polygon). When entering river names, follow the rules in section 3.1.3. Map item naming rules.